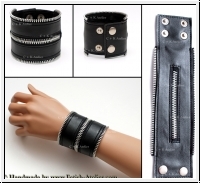 C & K Atelier - Fetish-Couture in highest Quality - Handmade in Germany - - Wristband "Zipper"
At the back side with snaps buttons and two adaptabilities. We sew the wristband after your order in our own atelier in a usual high quality. This Product was added to our catalogue on Saturday, 07. April 2018.